check out her enchanting and magical lamps and other creations! The requirements of this award are that I'm to list 7 things that I love and to pass the award onto 7 other deserving bloggers (and to notify them). 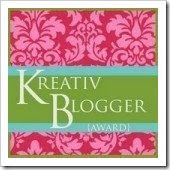 All the above blogs are interesting, inspiring and so much fun to visit and read. Now, I'm off to notify them! Wishing everyone a wonderful Sunday! Here in Ontario it is sunny and warm (8C or 46F - and that is warm for this time of year!). You can definitely feel and smell Spring in the air! Hey Sue!! Wow, thank you so very much! I am honoured! Ok, let me post this in a day or two--I am so backed up at the moment! Sue...thank you soooooo much! What a privilege to be selected by someone with YOUR Kreativ talent! Aw Sue Thank you! I am honored and thank you so very much! love your list of seven things too!!! have a wonderful week my friend! I have known from the start that we had lots and common but your list of seven things confirms it. That would have been what I would have said and now I have to come up with more. LOL! Thank you so much for the award! I will pick it up soon. Sue, I like what you listed as your 7 loves...especially the sound of the rain hitting your roof when you are in bed... Love it... and Congrats...An award that is well deserved by a special woman such as yourself!